1. Heat oil to 350°F in a large skillet. 2. Whisk egg and buttermilk in a small bowl. In another bowl, stir together cornmeal, flour and seasonings. Dip tomato slices in egg mixture, then dredge in cornmeal mixture, shaking off excess. 3. Fry tomato slices, in batches, in hot oil for 1 minute on each side; drain on paper towels. Remove any excess oil from the pan. 4. Season catfish fillets with salt and pepper and place in the skillet. Cook for 3 minutes, flip and cook an additional 3 minutes. Remove from pan. Cut fillets in half. 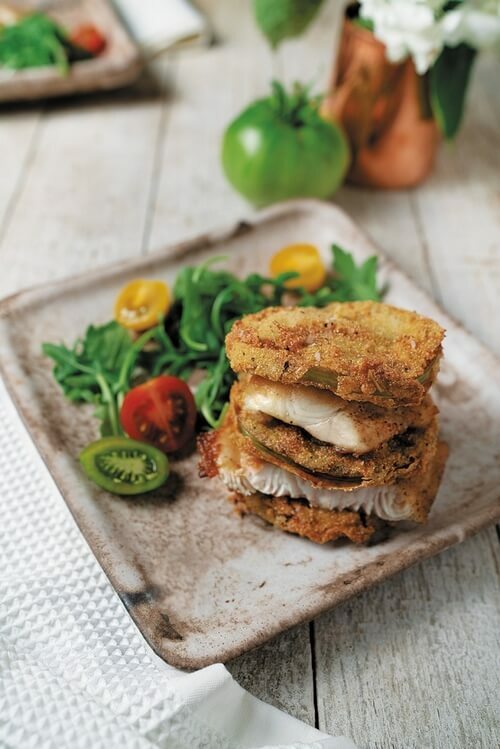 Place a fried tomato on the plate and top with catfish. Repeat, ending with tomato on top. Serve with a side salad and your favorite dressing.